ATT Access Service and Regular ATT Service? I currently have ATT Uverse internet service, I have their AT&T Internet Basic 6, Up to 6 Mbps download. But I recently found out about their new service called Access from ATT&T. Where you only pay $10 or $5 a month for internet service, but you have to be on SSI or get SNAP services to get this deal. There are five possible program speed tiers. * If you're assigned a speed of 10 or 5Mbps, you'll pay only $10 per month. ** And if your speed is 3 or 1.5Mbps or 768Kbps, you'll pay just $5 per month. You'll be assigned the highest speed available where you live. There is also an allowance to watch out for with this service - Service will include a monthly data allowance of either 150GB or 1TB of data per month depending on the type and speed of service you receive. If you exceed your monthly data plan allowance, you will be automatically charged $10 for each 50GB of data usage in excess of your data plan, even if less than 50 gigabytes is used. For more information, go to att.com/internet-usage. So is this AT&T Access deal a BETTER option or WORSE option available? Should I go with this offer or just stick to my current plan, which I pay $55.00 a month for. What do you think? Thanks for the help! Looks expensive, especially those lower priced plans. I pay $80.00 a month for 50 Mb/s download and 20 Mb/s upload for a FTTN service, and I get a free Fetch PVR and phone calls thrown into the plan. In my sig there is a pix of what speeds I get being less than 400 metres from the node. Unless you are on Social Security Supplemental Income or the Supplemental Nutrition Assistance Program, both low income programs, then you are not eligible for AT&T's Access program. The Federal Government mandated that everyone should have equal access to Internet Services. To help provide these low cost services AT&T attaches a surcharge to your phone bill to offset the cost of these services. Unless you have documented proof you fall into this low income category you will have to pay full price for said services. As for better or worse the point is moot. It is the same AT&T service you get not with the exception that regular service allows you 250Gb of data where Access only allows 50Gb. Interesting point that, less you pay less you get. I forgot to mention in my previous post that I get unlimited downloads, which is handy when streaming from Netflix and Fetch TV Movies. Actually it is just a shuffle of the cards Mate. For the 250Gb bandwidth I pay $55 USD. That adds up to around $10 USD per 50Gb. Only thing is I am not offered the tier service. I could do with 150Gb service saving me $20 USD. That's 100Gb I never use. I could probably get by with a 100Gb a month but I always believe in allowing for expansion. 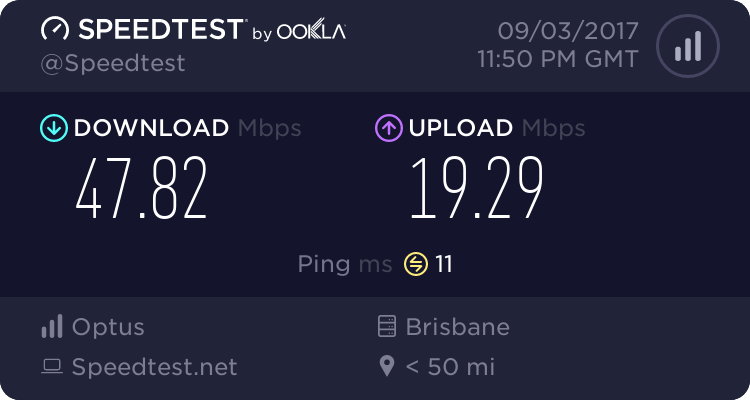 I was on 200 gig plan a month up to a couple of months ago, then Optus my ISP have given everyone on that plan unlimited downloads. Most I ever used on the old plan streaming, was about 150 gigs which included uploads.